I’m all for holistic and luxury pampering so featured as my Weekly Snap is a gift I received from a bestie – the Cardamom Rose Aromaveda Sachet Collection from Spa Ceylon Ayurveda. The collection includes three luxury fragrance sachets that uniquely combine natural volcanic minerals with pure essential oils to infuse your living spaces with rich natural aromas. I love their jasmine range so this was a change for me as I haven’t previously purchased anything of their products in the Cardamom Rose range. However, I was surprised when I found myself loving this fragrance as well. It doesn’t come across as strong and overwhelming as you’d think and I suppose that’s one reason why I like it. Each sachet ingredients are individually blended to ensure the natural well-being benefits of the essential oils are preserved well and truly. They are meant to soothe, calm and relax the mind, body and soul. I’m yet to start using them so let’s see if the sachets live up to what their supposed to do. 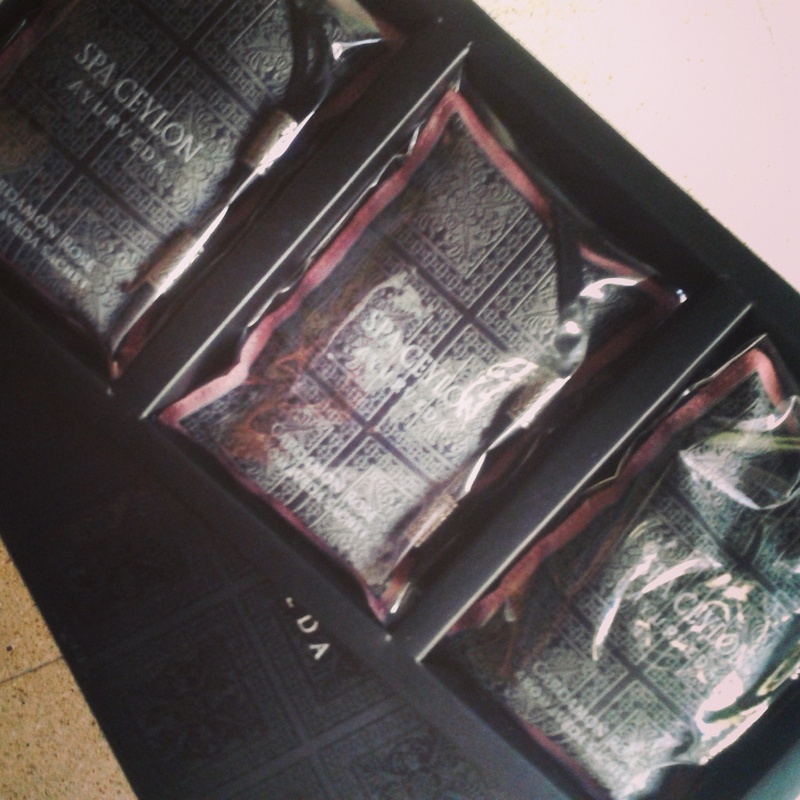 The sachet and gift box are adorned with royal insignia inspired by the Royal Kandyan courts of ancient Ceylon. This is something you’ll notice in many of the products by Spa Ceylon. If you want to know more about the brand and their products, check out their site. Remove cellophane covers and place sachets in suitable locations, preferably close to air vents, inside pillow cases, in wardrobes between clothes, suitcases or under drawer liners. To refresh the aroma add a few drops of the Spa Ceylon Essential Oil Blend to each sachet as required. Author justmePosted on July 27, 2014 July 27, 2014 Format ImageCategories Ceylon, Fragrance, SnapsTags ayurveda, body and soul, calming, cardamom rose, Ceylon, comfort, essential oils, holistic, luxury, mind, pampering, relax, room fragrance, soothing, Spa Ceylon Ayurveda, Sri Lanka, well-beingLeave a comment on Weekly Snap! I’ve probably mentioned this as couple of times before that I am a huge fan of the Spa Ceylon Ayurveda products. This is a Sri Lankan brand of products and they recently opened a branch in Mumbai, India. 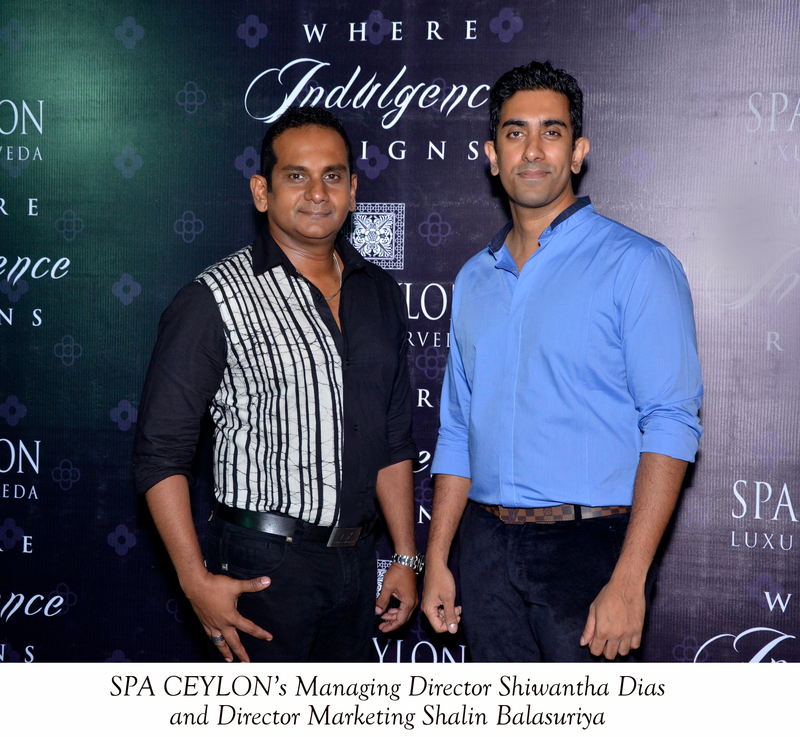 Spa Ceylon – Sri Lanka’s premier spa lifestyle brand – has just marked its entry to India’s highly lucrative luxury wellness sector with the grand launch of its flagship boutique in Mumbai’s fashionable Bandra Linking Road up-market shopping strip. Sri Lankan born Bollywood superstar Jacqueline Fernandez was among the exclusive guests list gracing the occasion. The brand already having an ardent Indian following, was greeted with much excitement and fanfare with extensive media coverage of the event. This is the 1st occasion a luxury Sri Lankan wellness brand has entered India. The unique Ceylonese themed single-brand Spa Ceylon boutique indulges shoppers with welcoming calming aromas and soothing signature melodies in the background. 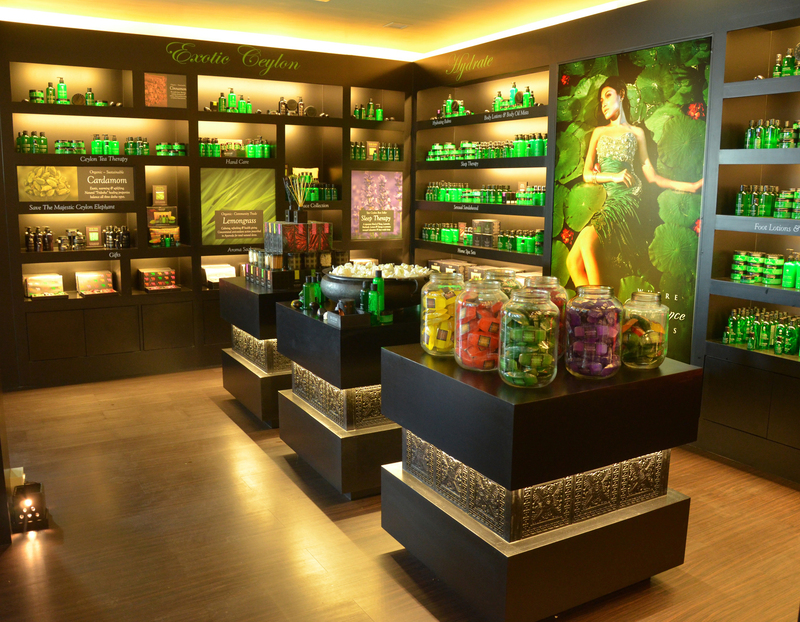 Offering fastidious Indian shoppers an assortment of more than 200 options in indulgent aromatic Ayurveda personal care, luxurious home aromas and Spa Ceylon’s pampering gift collections, the store is already welcoming a Bollywood celebrity clientele. In India, Spa Ceylon plans to open up to 4 more stores in Mumbai & also unveil a signature Spa Ceylon Luxury Ayurveda spa in Mumbai by year end, with expansions planned to other major metros across India, totaling to 25 locations over the next 2 years. Internationally, Spa Ceylon’s current presence in Istanbul, Turkey; Moscow, Russia; Fukuoka, Japan and more recently in Mumbai, India, will be further expanded over the next few months. The next store openings are scheduled for August ’14 in Singapore’s fashionable Orchard Road, with stores at Kuala Lumpur’s up-market KLCC Mall (September ’14), Korea’s hip Seoul shopping district (October’14) and waterside in the Maldives capital (October ’14) scheduled to open thereafter. Expanding in Sri Lanka, later this year, Spa Ceylon is scheduled to open a Dutch heritage themed boutique and spa in the Galle Fort, a royal Kandyan themed spa in a five-star resort in Kandy and another plush boutique in Colombo, expanding their network to 15 locations across the island. Spa Ceylon captures the romance of old Ceylon combined with ancient Ayurveda wisdom to create their range of majestic royal spa rituals and luxury product formulae designed to soothe, calm and relax the body, mind and soul. The unique designed jewel green bottles inscribed with Sinhala text and natural formulae enriched with local herbs and essential oils give these luxury Ayurveda products a true Ceylonese identity. The products are free of harmful surfactants, chemical bleaches, petroleum-paraffin derivatives & ingredients of animal origin, while being mostly naturally preserved. They are alcohol free, 100% vegetarian, not tested on animals, contain sustainably harvested & community trade sourced ingredients. The complete range of prestige skin, body, bath, scalp and hair care preparations, oils, balms and potions, home aroma blends, candles, hand-made stoneware and spa accessories are now sold internationally and available on-line too, with a new India dedicated INR on-line store launching later this month. Ebony hued gift boxes adorned with royal insignia from the Kandyan courts of ancient Ceylon add classic Ceylonese character to the Spa Ceylon gift collection, making them ideal for both personal and corporate gift giving. To buy on-line visit their website 🙂 Id definitely vouch for nearly every product because I’ve used most of them and have come to love them over the years. Some of the products I use include the Red Sandalwood Body Scrub, Ceylon Tea and Ylang Body Scrub, Neroli Jasmine Cleanser and Conditioner, Happy Uplifting Balm, Green Mint Cooling Foot Relief, Green Mint refreshing Foot Mist, White Jasmine Face Treatment Oil and the Cardamom Rose Home Spa Set.